- Restores your hard drive's performance, hard-drive space and protect your privacy by cleaning Internet history, cache, temporary files, Windows temp files, recent document list, find history, run history, *.CHK files, the recycle bin, additional garbage and much, much more. - Scans dead shortcuts from your Start menu and Desktop. If it finds any shortcuts that point to files that do not exist, it will list them for you. - Scans multiple hard drives. 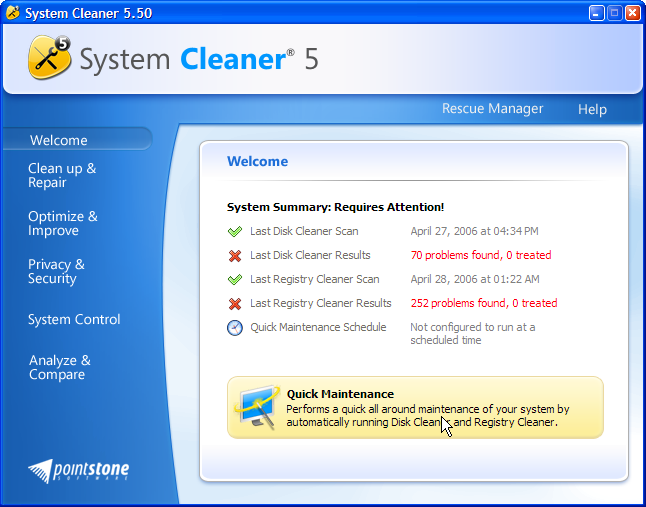 + Several improvements to the System Cleaner's interface. + 3 new utilities included: Internet Explorer Extensions Manager, Disk Space Explorer and File Associations Manager. + Pointstone Shredder. This new utility gives you direct access from Windows Explorer to securely delete files using one of the shredding algorithms included. Simply right-click on a file or folder and select "Pointstone Shredder". 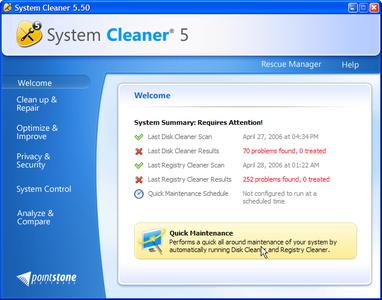 + Registry Cleaner: interface redesigned to better help view and correct the problems and errors found. + Disk Cleaner: Added the option to find internet cache files. Supports Internet Explorer, FireFox, Mozilla, Netscape and Opera. + Privacy Protector: Several improvements including support for the new FireFox 1.5 cache folder location and a index.dat viewer.
! Privacy Protector: Fixed an issue that prevented removing index.dat files on some systems. + Rescue Manager: added feature to filter the backups by individual utilities. + Improved the Duplicate Files Finder utility to be more user-friendly.